Ever since the early 90's when I was a wee boy at school, I collected Star Trek comics. Now, call me a geek (I don't care) but even to this day I still read them. Some of the stories are wonderful, and the artwork in certain issues still looks great. Now, comics are brill (especially zombie ones as well!!).... if not for the poor, flimsy paper that they are printed on. My collection of Star Trek comics which I had been collecting for nearly two decades were beginning to show wear and tear so I decided awhile back that maybe it would be a great idea to scan each issue and store them digitally on my computer so that they would never deteriorate. Although I had been planning to do this for quite some time now, I began the project officially on January 12th 2004 when I decided to buy a scanner just for the job. A nice cheap Packard Bell Diamond 2400 Max for about £40 which I didnt even think would last 50 issues!!! -5.63Gb of storage capacity on my computer. 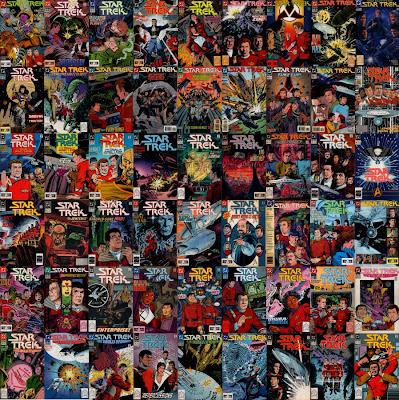 These comics range from the complete collections of early Gold Key, Marvel and DC comics (Both First and Second Edition TOS and TNG), through to the more recent Wildstorm and IDW issues. They also incude Annuals, Specials, graphic novels, hardbacks. Well... I think the re-design is finished. I'm quite pleased with the finished template. Captains-Blog is going through some big changes at the moment, so don't panic if things don't look the way that they should on your monitor. I tried, but I just wasn't too sure about the last design change to this blog. It looked fab on my computer, and it looked alright on some of the computers at the school, but I did notice that it just did not appear the way it should do in Firefox, and in Internet Explorer 6 or below. So, here we go again with a new redesign. Not too sure on this one either, so expect another change soon. I've already changed some of the code, but I think I'm going to dabble with changing the fonts and see how it looks after that. Following on from the post I made last night, I was able to get through to the company who deal with my domains and the problem was sorted - apparently it was a fault on their end. I was really worried that I might have lost the domain. Afterall, I've had it for 6 years now, and I rely on it a great deal, mostly for emails though. Anyway, changing subject - what do you think of the new Blog template that I have designed? I have tried it out on Internet Explorer 7 and Firefox 2 and it appears to look alright. I had an issue with Internet Explorer 6, but I think it may have had more to do with my laptop than anything else. The template was based on an existing one, but I changed so much of the code that it's almost a complete new design. I would love to hear any comments on the new design, and for visitors to tell me if the blog doesn't appear as it should on their OS / Internet browser - so please leave feedback (good or bad) and let me know. I renewed the domain last week, but it's now telling me that it will expire on the 1st January 1970!! Anyway... Put simply, stu-wilson.com (the website) will probably be down as well as everything that is on my website (including the graphics for this blog). I will also lose my email addresses as well. I'm hoping to ring them up in the morning to see if I can sort it out, but it may be too late. I'm not sure if the domain expires at midnight tonight, or midnight tomorrow night. Captains Blog may appear strange (or may not even work) today and over the next few days as I have decided to finally do something about the rather naff layout of the blog. You can thank Dan over at http://www.0ddness.co.uk/ for this because he is always changing his template/layout, and I felt I'd better do something with mine. Bit of a techie post today. I've spent the last two days at school finishing the installation of our new server - our 4th one, and a lovely new toy for me to play with!! 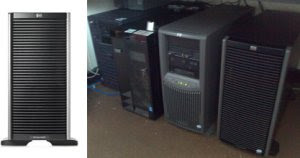 It's an HP Proliant ML350 server with 2Gb ram, Dual-core Xeon Processor with 6x 300gb hot-swappable drives with a Lightscribe DVD writer and HP Ultrium 448i tape drive. It's all been set up and ready for the start of the new term in two weeks time. I also had a go with playing on a Nintendo Wii for the first time today. I must admit, I haven't been that impressed with the software titles that are currently available for the console, but we set the console up in one of the classrooms and played Wii Sports using one of the interactive whiteboards via a projector and it was great fun - I especially liked the Bowling and Golf games. I'm actually tempted to get one myself now! Actually we got back on Wednesday the 15th but we had my Mum and Dad come back with us and stay a few days. They've only just gone home, leaving me and Kieran at home while Michelle returns to work, so I'm just sat here at the computer listening to the excellent movie soundtrack to George (The King of Zombie Flicks) Romero's "Day Of The Dead" with Kieran playing with his cars next to me. As I've been getting more and more into photography lately, I did take some fab photographs while we were away - one in particular of Hadleigh Castle which I have recently posted on http://www.renderosity.com/. Pop along and rate it if you have a few moments to spare (although you'll need to be a member), or take a look at it below. I'll hopefully be posting some more pictures that I've taken over the next coming days/weeks. These will appear here, on my website at http://www.stu-wilson.com/, and over at http://www.renderosity.com/. Anyway, going off subject...... I can't believe that I've had 4 weeks off work already. The summer holiday has gone so fast. I've still got 2 weeks to go before I go back to work normally again, but I do have to pop into the school tomorrow for a few hours as we are having a new server that is being delivered and that needs installing. I'm training Kieran up so that I don't need to do any more housework while Michelle is at work during the school holidays!!!! Check out the small video below to see what I mean! Click here if clicking on the image doesn't work. Oh, and I'm joking by the way about getting kieran to do the housework - I know how gullible some people are out there! Well, after nearly two years of "should I", or "shouldn't I", I've finally decided to go out and get myself a PSP (Portable Playstation), and boy am I happy with it!! Of course I wouldnt have got one if it wasn't for the possibility of being able to play homebrew software and ISO's downloaded from the internet. 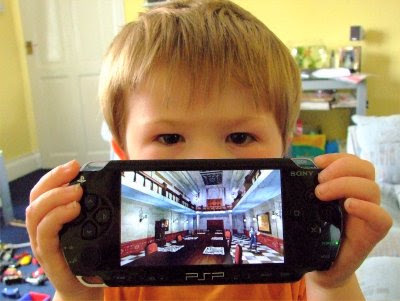 Normally this is not possible with a PSP with its default firmware, but fortunatly the PSP I purchased came with the 3.40oe-a firmware which makes this possible. What it does mean is that I can play all my old PSone games on the PSP without the need of an emulator (at full speed and without the need of a PlayStation 3 to transfer them over), and I can also play games directly from the memory stick rather than UMD disks. In other words, it can do all kinds of stuff that Sony would prefer you not to be able to do!